National Chili Month begins on October 14th and who doesn’t love chili? Plenty of classic movie stars certainly did, and many of them shared their personal recipes with fans via magazines, newspapers and cookbook collections. The trend probably began with those good old lasso-flinging, chaps-wearing, spurs-jangling cowboys. Will Rogers, Gene Autry and Tex Ritter all offered up their own special way of making this signature dish. I like to imagine all three of them sitting around a campfire scraping up the last of their chili and beans from metal plates, then having a right old singsong. Chili was also often the meal of choice for those typically cast in tough-guy roles, like Barton MacLane, George Raft and Victor McLaglen. 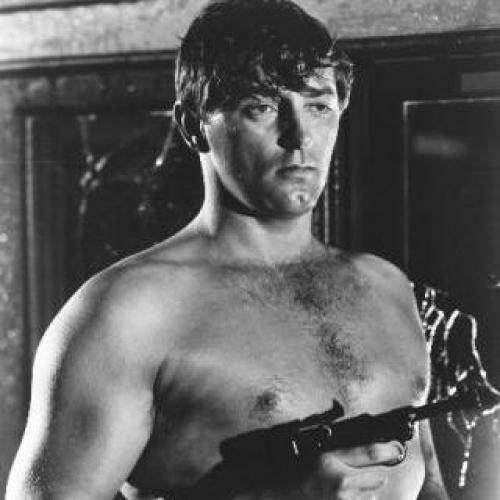 It’s probably no surprise therefore, to learn that beautiful bad boy beefcake Robert Mitchum was a huge chili head. 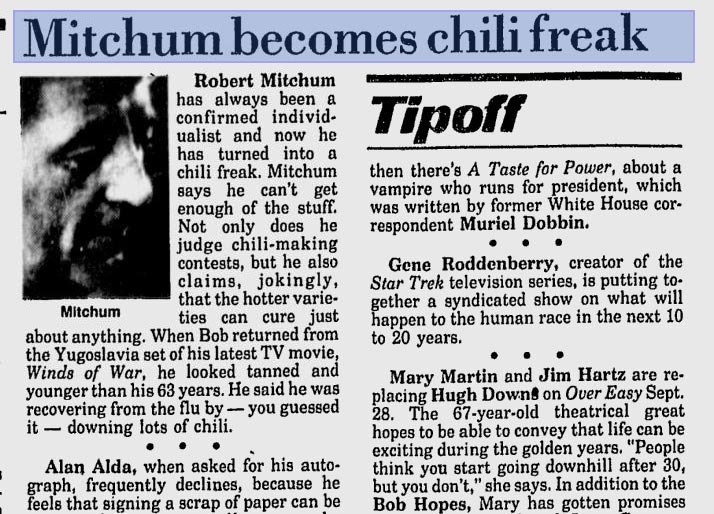 Mitchum was a judge at the International Chili Society’s legendary championship cook-offs in 1975, 1980 and 1992. He was well qualified for this task, as he often stated how much he loved chili, claiming the hot stuff could cure all ills, particularly influenza. Cook bacon in large stock pot until crisp and brown. Lift out bacon, pour off excess fat so only 3 tablespoons remain (or use olive oil). Brown onions slowly in fat until soft; lift out. Shake cubed beef in seasoned flour; brown quickly on all sides in onion-flavored grease (add more olive oil if necessary). Add browned onions, garlic, beef stock, vinegar, tomatoes, chili powder, water mixture, bay leaves, cumin seeds, sugar, salt and pepper to taste. Mix well. Bring to boil. Simmer slowly for 3-4 hours. Add chocolate during last half hour. 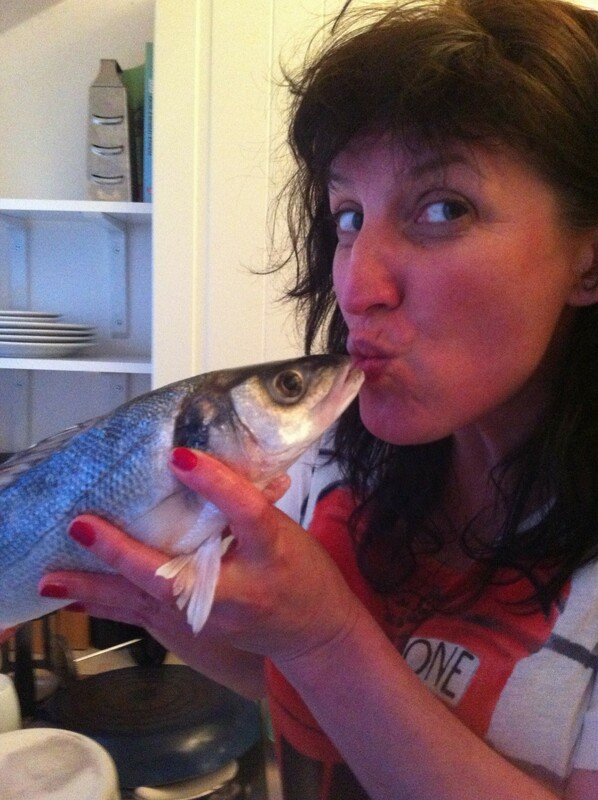 Taste to adjust seasonings. Add more liquid during cooking if needed, stir often to prevent sticking. Serve with cooked pinto (or kidney beans) on the side. Top with chopped sweet onion if desired. Jenny Hammerton is a film archivist with a nosey parker interest in what the stars of Hollywood Golden era liked to eat and drink. She’s been scribbling away about film star recipes for around eight years at Silver Screen Suppers and her bulging collection of film star favorites now numbers over 5500. When not cooking and writing, Jenny works with the British Movietone newsreel collection for the AP Archive in London, and DJs on a wind-up gramophone with The Shellac Sisters. This entry was posted in Columnists, Eat, Eat: Book Excerpts, Eat: Recipes, Films and tagged chili, Eat, Films, Jenny Hammerton, recipe, Robert Mitchum, stars. Bookmark the permalink. The LA Times used to print the stars special recipes in the ’70’s or ’80’s. 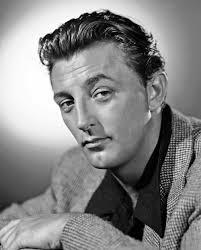 Mitchum had one for Beef Mole that had peanuts and chocolate in it, that could be used for burritos , spaghetti or chili. Please find that one and post it. You wouldn’t believe how good it is starting with that for a base.